I read in one of my Food Network magazines some secrets for successful summer grilling. My man Guy Fieri's quote "Brine, Brine, Brine" stuck with me and that's what I did. BRINE! In a small pot, heat water and mix salt, soy sauce, brown sugar and garlic. Mix well until salt and sugars are dissolved. Set aside and cool. Place chicken in plastic container, pour cooled brine and 2 cups of cold water over chicken. Drizzle oil and give it a little mix. Cover container and place chicken in fridge for at least 2 hours. *Remember, you can always adjust the intensity of the brine. Have fun experimenting. I've also used sugar substitute for a sugar-free option. Bake chicken according to your recipe. For the chicken pictured, I baked the chicken on a grill pan at 375 degrees for 45 minutes or until juices run clear. For the last 15 minutes baste chicken with your favorite BBQ sauce and bake a little longer until you get some caramelization. There Should Be a Grandmother's Day! It's great that we have a Mother's and Father's Day, but how about Grandparent or Grandmother's Day? I'm sure I'm not the only kid in the world that has/had good grandparents. There is one grandparent that I wish I had more to time with...my Grandma Esther. From what I can recall, she had a strong and feisty spirit, strict at times. Whenever we, grandkids, had the chance to be with her, I knew I always wanted to be on her good side. But the fondest memories I have of her have to be moments involving food. I remember her kitchen in Joplin, Missouri. Spacious, from a child's perspective, with pale yellow walls or cabinets. Maybe it was the sunlight that made them yellow but it was bright and airy inside. No matter if it was the kitchen in Joplin or in Olathe, Kansas, I would always feel comforted by the aroma of steamed rice filled the room. I remember coughing and running away from the kitchen when she would make her roasted red chili paste. I even recollect her herb garden in the far corner of the backyard, the temperature always seemed cooler there no matter how hot it got during those humid Midwest summers. The sprigs of cilantro and sweet spearmint perfumed the cool of evening and it all just felt right in the world. I felt as if my father was whole and our entire family felt close, all because of her and haven she created. My passion and love for food has been fueled by my mother and my grandmother. It's a beautiful thing to still enjoy someone's life through the recipes they have passed down. My grandma Esther's spirit is still around whenever we come together to enjoy a bountiful Sunday dinner of roast beef, mashed potatoes, spring rolls and a mean broccoli & cheese dish. Oh and don't forget the rice and hot chili paste. 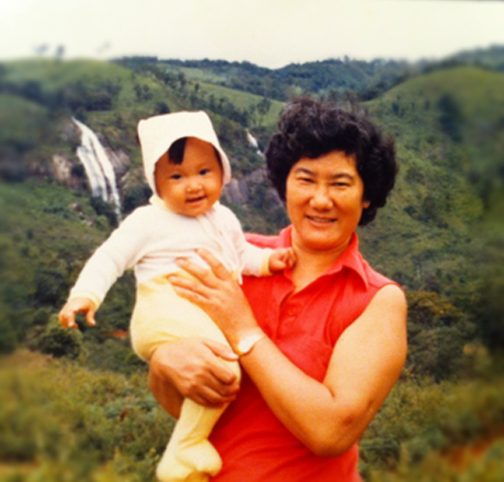 I'm so glad my mother learned as much as she could from Grandma and passed down that knowledge to me. My aunts, Lucy and Sumalee, also learned from her and it's wonderful to experience Grandma through them when we all get together for Thanksgiving or Christmas. So, Grandma, I want you to know that your life made a difference and will continue to make a difference in generations to come. I wish was old and wise enough to get to know you more. Thank you for loving God and loving your family the way that you did. I can tell my Dad still misses you until today but we have a Hope that we all will be together again. Love you and Happy Grandmother's Day from my heart! I'm a big fan of caramel and butterscotch. So when I found this recipe, I couldn't wait to make it. The cake I made is what candy lovers would call a Turtle cake. Bake your favorite chocolate cake, grab a bag of pecan halves/pieces and bring it all together with this Caramel Butter Frosting that is sure to become a family favorite. Melt butter, then add brown sugar. Bring butter and brown sugar to a boil. Set aside to cool slightly (3-4 minutes). Add milk to mixture and beat until smooth. Gradually beat in confectioners' sugar until mixture is of spreading consistency. My husband and I have varying opinions of what we like for food pictures...so I'll post the photo he liked best. Love you, Babe! Have a summer Tiki party coming up? No worries! Bring Ambrosia to the luau. I was looking for sides that would go well with ham dinners, and a recipes for Ambrosia popped up in searches. About.com had a great recipe in their Southern Food section. I also looked through some cook books and found one recipe for Ambrosia that I liked. The recipe I'm sharing today is a combination of the two. If you are a sweet tooth, feel free to add mini marshmallows and ginger ale. Peel and remove as much membrane as you can from oranges. Cut into 1-inch chunks. 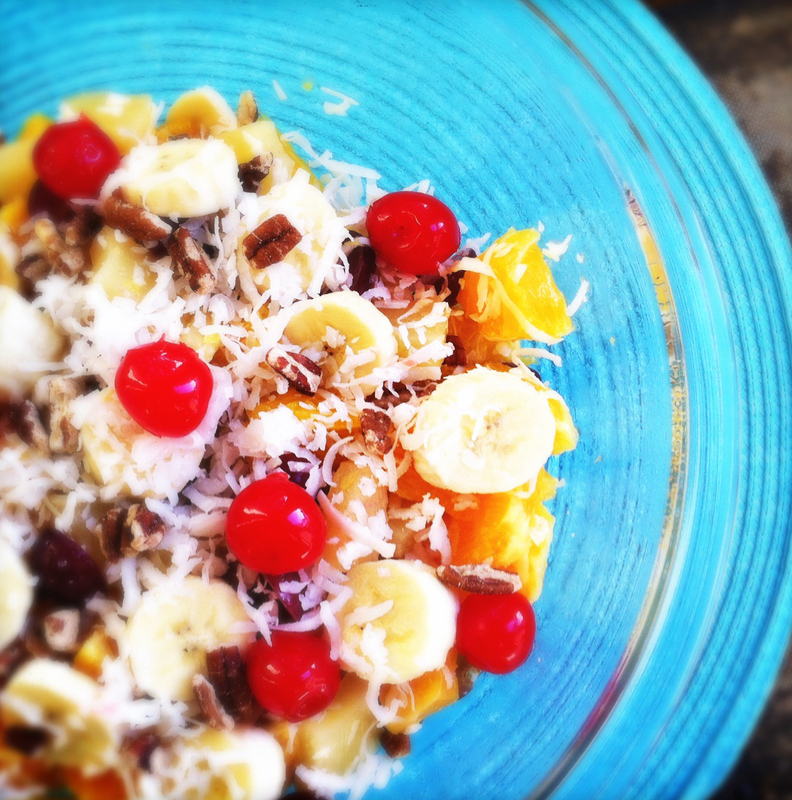 In large bowl, mix pineapple chunks, oranges, grapes, 1 cup of shredded coconut and 1/2 cup of pecans. Pour orange juice & pineapple juice over mixture. Mix well, cover bowl and chill. Before serving, peel and slice bananas and add to fruit mixture. Garnish with 1/2 cup shredded coconut and 1/4 cup pecans. Dot with maraschino cherries. This goes out to Better Homes & Gardens circa 1965. I can't believe I actually made this thing of absolute delight and flavor. Initially, I was a bit hesitant in trying to bake an Angel Cake and Daffodil Layers from scratch but I forged ahead and did it anyway. The ingredients didn't sound too wonderful for me since I'm not a big fan of eggs and more eggs. However, I was wonderfully surprised. I was so proud of myself I almost finished the entire cake. 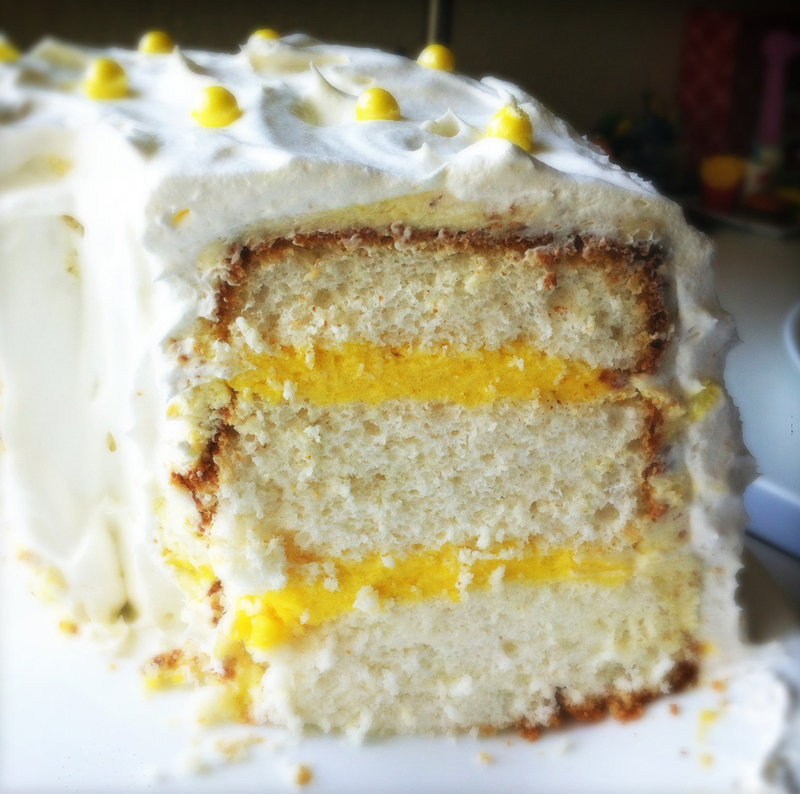 I added a little more lemon zest to the Daffodil layers and gave it a whipped cream/butter like crumb coating. Beat whipping cream with some zest and 1/4 sugar...texture should turn out like butter. Crumb coat cake and chill. Once chilled, frost with Sugar Free Cool Whip. Recipes below are verbatim from Better Homes & Gardens Dessert Cook Book. Sift flour with 3/4 cup sugar 4 times. Beat egg whites with cream of tartar, salt, and vanilla till stiff enough to form soft peaks but still moist and glossy. Add the remaining 3/4 cup sugar, 2 tablespoons at a time, continuing to beat until meringue holds stiff peaks. Sift 1/4 of flour mixture over whites; fold in. Fold in remaining flour by fourths. Bake in ungreased 10-inch tube pan in moderate oven (375 degrees) 35 to 40 minuets or till done. Combine gelatin and 1/2 cup sugar in top of double boiler; add yolks, lemon peel and juice. Cook over hot, not boiling, water, stirring constantly until slightly thick and gelatin is completely dissolved, about 5 to 8 minutes. Cool until partially set. 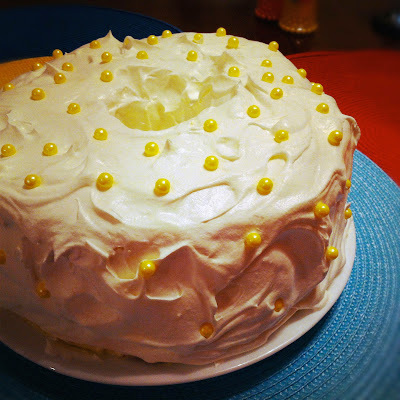 Beat egg whites till soft peaks form; gradually add 1/4 cup sugar, beating to stiff peaks. Fold into gelatin mixture. Tint with few drops yellow food coloring. Trim or brush crusts from cake. Cut crosswise in 3 equal layers. Spread bottom layer with half the gelatin mixture; add second cake layer and spread with remaining gelatin; top with third cake layer. Chill well. Frost with whipped cream [Cool Whip]. Makes 10 servings.